California's current drought is pretty exceptional -- like the driest in about a millennium -- according to an article published today in the journal Geophysical Research Letters by scientists with the University of Minnesota and Woods Hole Oceanographic Institution in Massachusetts. But how could they know that? There weren't a lot of rain gauges in California in 800 A.D. -- at least, not the plastic kind. 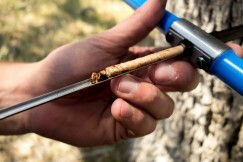 So authors Daniel Griffin and Kevin Anchukaitis looked to tree-ring samples from California blue oaks. The researchers collected their own blue oak tree-ring samples from south and central California, giving them a pretty good idea of yearly precipitation in the area back to 1293. They then augmented their samples with data from the North American Drought Atlas and the National Oceanic and Atmospheric Administration Palmer Drought Severity Index. The result: The study estimates that in the past 1,200 years, there have been 66 dry periods lasting three-to-nine years and 37 more-severe, three-year droughts. But not one of them has been as extreme as the one beginning in 2012, despite some years in the past seeing similarly low precipitation. It's not only lack of rain that makes a drought, though. Record-high temperatures added to California's strife to make this dry spell the worst in more than 1,000 years, according to the study. 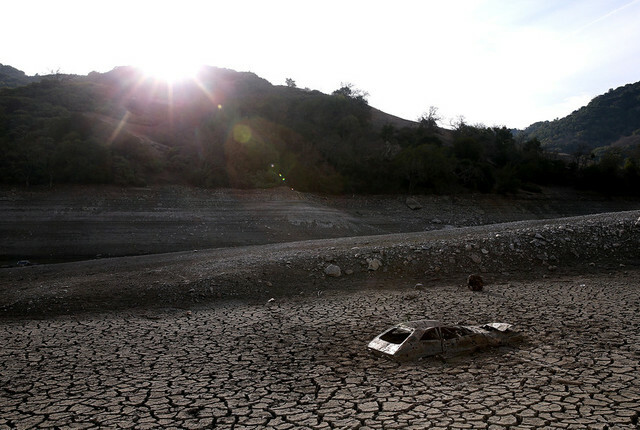 The researchers estimate high temperatures have intensified the drought by about 36 percent. UC Berkeley geology professor and researcher Lynn Ingram said the study's findings appear solid. "The tree-ring records provide the highest resolution as they have annual growth layers," she said, adding the study provides a "cautionary lesson" about how human-caused warming "may already be impacting climate and water in California." Watch the California drought progress from the beginning of 2011 to the end of 2014 below. The NOAA U.S. Drought Monitor released the latest outlook today, up-to-date as of Dec. 2. More than half the state is now in "exceptional drought," defined as "exceptional and widespread crop/pasture losses; shortages of water in reservoirs, streams, and wells creating water emergencies." Click on the legend for a description of each drought category.